The IP3 performance of a radio can be improved by sacrificing sensitivity, but Icom considers this a poor choice. 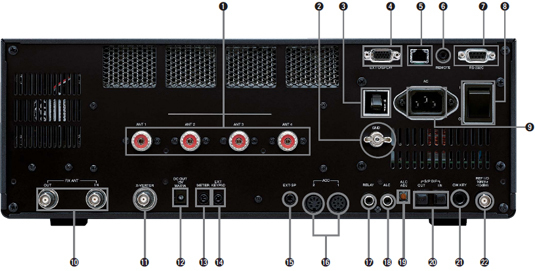 To achieve REAL high-performance, Icom reviewed all of the analog receiver circuitry. 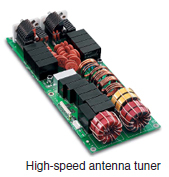 The IC-7700 employs mechanical relay BPF switching, a digitally tuned pre-selector, and three Hi-spec 1st IF filters (roofing filter) in a Dynamic range characteristics (in 14MHz band) clean and simple double-conversion superheterodyne design. By balancing the analog and DSP functions, the IC-7700 provides superior sensitivity simultaneously with a superb dynamic range of 110dB, and +40 dBm IP3 (even in USB mode with 2.4 kHz filter bandwidth).. While some may lead you to believe that coils and capacitors are all created equal, at Icom we know design excellence. Rather than using switching diodes that can introduce distortion, the IC-7700 design utilizes high-grade mechanical relays along with large capacitors and toroidal coils; resistant to magnetic saturation, providing superior linearity, and greatly reducing distortion. The IC-7700 employs three Hi-Spec 1st IF filters (roofing filters) of 15kHz, 6kHz and 3kHz before the 1st IF amplifier. Icom ordered special customized high specification devices to improve IMD and achieve better impedance characteristics. 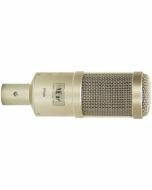 As a result, the 3kHz 1st IF filter provides approximately 134dB*2 of blocking dynamic range and allows you to pull out a weak signal in the presence of strong adjacent signals. Frequency control of the IC-7700 is maintained by the high stability Oven Controlled Crystal Oscillator. The OCXO achieves frequency stability of ±0.05ppm across the specified temperature range, meaning that the frequency will deviate only 5Hz out of every 100 MHz! This specification is equivalent to that of specialized measuring equipment such as signal generators or spectrum analyzers. 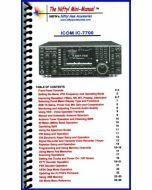 Also, a 10MHz reference signal can be input to the IC-7700 or output for use by external equipment. 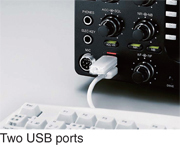 Two USB ports on the front panel allows you to easily connect a USB type keyboard or USB memory stick to save transceiver settings, update firmware, or transfer settings to other IC-7700. Making big scores means keeping your team fresh on those long DX-peditions or Multi-Operators contests. Swapping out operators usually involves time-wasting radio tweaks, because each operator has their own favorite settings to best match their operating style. This all changes with the USB drives! 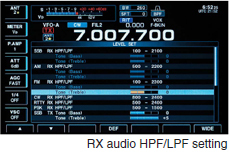 Prior to a contest, operators may record their preferred IC-7700 settings such as filter, Digital Voice Recorder (DVR) memories, antenna settings, etc. When it’s their turn to operate, simply insert their USB Drive into the IC-7700. In a flash, the IC-7700 is now “their rig”, and there’s nearly zero down time! The DSP-based digital IF filter of the IC-7700 rejects signals out of the pass band, and keeps the desired signal free of any distortion or degradation of quality. Depending on the operating situation, for example handling a pile-up or receiving a very weak signal, you can flexibly change sharp and soft filter shapes or reduce or shift the filter width, even while receiving a signal. 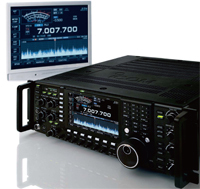 The IC-7700 has the S/P DIF optical digital interface for audio output and modulation input. 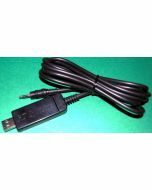 By connecting an external digital device* through a connecting cable, flexible audio tuning is possible, while keeping good sound quality. The IC-7700 uses two MRF150 power amplifiers connected in push-pull configuration. 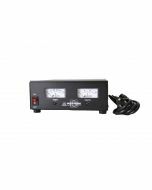 The power amplifiers provide a reliable 200W of output power up to 54MHz. 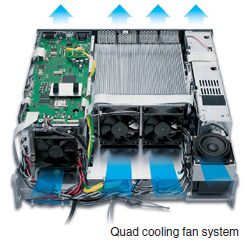 The effective quad cooling fan system makes it possible to generate 200W full power output even during full duty cycle operation. 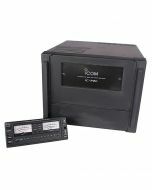 The digital PSN modulator using a DSP unit consistently reproduces an outstanding signal-to-noise ratio, providing clean and clear transmission. 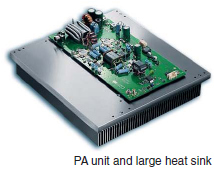 The PA amplifier uses a 48V DC supply to provide output power with low IMD on all bands. The IC-7700’s memory keyer has 4 channels with 55 characters for CW, 8 channels with 70 characters for RTTY and 8 channels with 70 characters for PSK31 operation. The memory keyer is convenient for programming station information, calling CQ and call sign for a DX-pedition or contest. Also, the CW memory keyer has other time saving functions such as automatic repeat, serial contest number auto-counter, and Morse cut number functions.